At Villa Bloom Bali we are specialised in organising Authentic Bali Experience Programs, so everyone participating! A Villa Bloom Bali specialty is bringing those cultural and spiritual experiences to you at the premises or in the direct neighbourhood. We offer from Outdoor Activities, to Cultural and Spiritual experiences, to cooking courses by our Private Chef who is specialized in Healthy Food. There is a lot of kids friendly activities and places to visit. If you like, we will arrange packed lunches for you to bring along. After booking you will receive our extensive activities guide. Our goal is to help you in any way to make your experience of Bali and Villa Bloom Bali unforgettable. 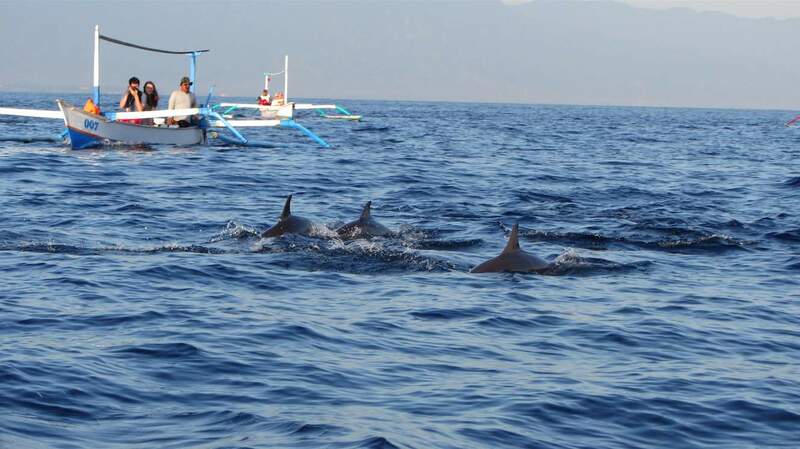 Dolphin watching is one of the main attractions in the Lovina. Every morning the dolphins are active in the bay, just a short boat ride from the coast. The dolphin pods favour these calm waters. You can glimpse several different species of dolphins, but most frequent are the dark-skinned spinner dolphin which visit Lovina’s bay all year round. At Villa Boom the massage ladies come to the villa to give a massage, either in the garden or in your room, whichever you prefer. Traditional Balinese massage techniques include acupressure, skin rolling and flicking, firm and gentle stroking. On the menu is also hot stone massage, manicure/pedicure, facials, reflexology and body scrub. Yoga classes are organised at the villa, the yoga teacher will come to the villa for guided yoga classes in different styles. The yoga classes will be adjusted to the level you are at, including beginners. There is several spot around the property that are suitable for yoga, either on the yoga deck overlooking the valley, at the covered terrace of the house or at the terrace near the pool. It’s just a matter of preference. Penny’s cooking classes are fun and full of facts of food. Not only their taste and texture, but also how different ingredients affect each other, characteristics of food and cooking styles and the effect of nutrition on the body. Be amazed with her knowledge. Meditation promotes the peace of the present moment. Meditating on your own requires some effort, while guided meditations literally walk you through a meditation and help you find a calm and peaceful state; we offer this at Villa Bloom, either on an individual basis or for the whole group. A lot of guests like the combination of meditation class and a healing massage. Villa Bloom owns 2 stand up paddle boards, as the owners loved this sportive activity themselves to paddle out to the Lovina reef and do some snorkelling and even spot dolphins or jumping tuna fish. Stand up paddling is easy to learn, it requires a 2 minute learning curve and it’s a great way to be active out at sea. Lovina has flat water conditions most of the time which makes is easier for all level. For snorkelling, any boatman can take you to the Lovina reef. The backside of the reef is interesting, and if you bring some bread you’ll attract lots of fish. The coral is very easy to access. There is lots of starfish to enjoy for the kids. For diving, Introductory dives and night dives are performed at the Lovina reef. Instruction and an introduction can take places in Villa Bloom’s pool). Companies take people to Menjangan, Ahmed and Tulamben on day trips. Mrs. Luh Padmi is well known in the area by the Balinese, expats and tourists for reading peoples palm. Regardless of your age she reveals elements of your past, current and future, which you can embrace and use to your advantage. It is an amazing experience. She also offers yoga and cleansing ceremony. The yoga postures will open up your body so you are more receptive to this ritual. From Villa Bloom multiple trekkings are organised. Walk through the hills and forests with a beautiful view over the rice fields and the North Bali Sea. Swim in the Blue Lagoon, jump and slide off waterfalls (optional) and finish at the mystical Aling-Aling waterfall. Learn about exotic plants and trees (clove, coffee and cacao). Other trekkings are around the mountain lakes, through pristine jungle and along ancient temples. From Villa Bloom you can explore the authentic slow paced Bali. There is a beautiful Buddhist temple in the village of Banjar. It is small version of the famous Borobudur in Java. Views over the mountains and the sea are gorgeous too. The same village hosts hot water springs with warm sulphur water, gushing out of dragonheads in a superb setting. The water has healing power for skin allergies. In the botanical gardens in Bedugul the Bali Treetop Adventure Park is located. The zip lining here is a great activity, with different levels for every level of challenge. There is special tracks and zip line options for kids so they can enjoy the fun and challenge too. We love to go there! Krishna watersports organises watersports like banana boat and jet skiing, for some adrenaline pumping fun on the water. They also opened a theme park with attractions for children and adults called Funtastic Land. The souvenir ‘shop’ alone is worth a visit as it has a great collection of t-shirts and Balinese souvenirs to bring home. There is several waterfalls to be explored. Teh Aling-Aling is situated in a beautiful gorge and there is multiple smaller falls a bit more downstream. Sing Sing waterfalls are nice for swimming, it is recommendable. On your way to Bedugul via Singaraja you will find the Git Git waterfalls, the highest falls on Bali. Bali Handara Golf Course one of the most astonishing golf courses on Bali. The golf course is set in the highlands of Bali and nestled in the crater of a volcano in the mountains of Bedugul. The golf course is pleasant to play due to mild temperature and the overwhelming view of lush tropical forest.